I was in a meeting today with Kim from our Mayo Clinic Quality office discussing how social media and tools like the Flip video camera could be used in her work, and she mentioned that she had heard about a hospital in Texas that was giving GPS units to patients when they checked in, so they could more easily navigate to their appointments. She said she had been wanting to track down the name of that hospital so she could get in touch and learn from the experience to see whether it’s something we might want to try, but that she didn’t really know where to start looking. So she had procrastinated for a few months at least because, as David Allen says in Getting Things Done , if you don’t know what the next action is, you can never move projects forward to completion. …and I also had several other responses telling me about RFID options and a pilot program that puts GPS devices in the shoes of Alzheimer’s patients to help track them if they go wandering. But besides the answer I was seeking, having asked the question on Twitter led to some new alternatives that I think Kim hadn’t been considering. Using relevant hashtags is a great way to have your tweet go to people beyond those who follow you directly. In this case I used #hcsm and #hcmktg. I’ve participated more in the former than the latter, but knowing about them enabled me to ask a relevant question in a virtual space where like-minded people gather. Investing time in Twitter builds capacity for future efficiency. The fact that I was familiar with Twitter, had some followers and knew some appropriate hashtags meant that I could find out in 12 minutes what had stymied Kim for several months. 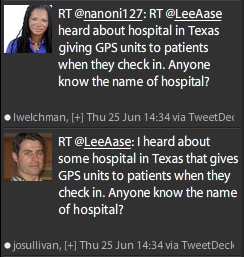 It’s possible that a new Twitter user with a question like that would get an answer, but likely only if a vendor had a Twitter search term set for “GPS.” Twitter isn’t a quick fix; it’s built on relationships. That takes some time, but once you’ve put in some effort you will see that the community will come to your aid. With Twitter, I didn’t have to know where to start looking, or who to ask. I asked my tweeps, and some of them passed it along to their tweeps. With email I would have had to decide where to send the message. With Twitter the message just seems to find the right people, provided you have started by putting in a little time to start a network. Thanks to @stephaniethum, @nanoni127, @shamsha, @BethHarte, @JohnSalmonHUP, @josullivan, @lwelchman, @Cascadia, @lisacrymes, @DaphneLeigh, @DynamicRFID, @NickDawson, @tstitt, @mkhendricks, @MikaLofton, @mkmackey, @ljstarnes, and @gelogenic for participating today! That’s the power of Twitter: 18 people coming together with no notice to discuss a topic and get an answer to a perplexing question (and to suggest other interesting alternatives) in less than an hour. Author Lee AasePosted on May 9, 2008 Categories Facebook, videoTags Facebook, Mayo Clinic, Quality, video, YouTube4 Comments on Can YouTube Beat Facebook Video Quality?